This is a timeline of the War in Donbass, for March 2018. 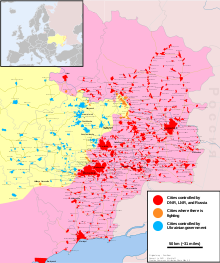 The timeline follows an ongoing conflict between Ukraine and anti-government pro-Russian separatists supported by Russian troops in the Donbass region in eastern Ukraine. The ATO HQ reported in the morning that pro-Russian forces had opened fire on 5 occasions on Ukrainian positions the previous day (including once in Donetsk region and on 4 occasions in Luhansk region); the fire was returned twice. The spokesman of the Ministry of Defence on issues related to ATO reported at noon no casualties in the Donbass region on the last day of February. Pro-Russian officials at Donetsk city reported five Ukrainian violations of the ceasefire in the regions of Horlivka and Donetsk city. The Ukrainian military employed small arms, snipers, heavy machine guns, automatic grenade launchers, 73 mm antitank recoilless rifles and 120 mm mortars to attack pro-Russian positions at four different areas. No Ukrainian ceasefire violations were reported in the self-proclaimed Luhansk People's Republic. According to the information provided by the ATO press-centre in the evening, as of 18:00 pro-Russian forces had opened fire on positions of Ukrainian troops once, in Luhansk region, where 82 mm mortar rounds landed in Svitlodarsk. Later in the night, pro-Russian armoured vehicles, supported by rocket launchers and 82 mm mortars, engaged Ukrainian redoubts at Pisky, west of Donetsk city. No casualties were reported. Separatist media reported that Ukrainian forces engaged pro-Russian positions around Donetsk city using small arms, heavy machine guns, automatic grenade launchers, 120 mm mortars, tanks and artillery. The main targets were the areas of Yasinuvata, Spartak, Trudovske and Staromyhailivka. According to the information provided by the spokesman of the Ukrainian operational headquarters in the morning, pro-Russian troops had opened fire on 2 occasions on Ukrainian positions on the first day of March, once in Donetsk and once in Luhansk region. The spokesman of the Ministry of Defence on issues related to ATO reported at noon no casualties in the Donbass region on the first day of March. Pro-Russian authorities at Donetsk city recorded three Ukrainian violations of the ceasefire in three locations using small arms, heavy machine guns, automatic grenade launchers, 73 mm antitank recoilless rifles, 82 mm mortars, antiaircraft guns, armoured personnel carriers and armoured fighting vehicles. The Ukrainian military attacked pro-Russian positions at Dokuchaievsk and Petrovsky district using infantry weapons, automatic grenade launchers and 82 mm mortars. In the region of Mariupol, armoured fighting vehicles opened fire on pro-Russian forces supported by small arms, heavy machine guns, automatic grenade launchers, rocket launchers and antiaircraft guns. Over the past week, there were 65 violations of the ceasefire; Ukrainian troops fired 82 mm and 120 mm mortars 252 times and 122 mm and 152 mm self-propelled artillery 38 times. two pro-Russian soldiers were killed and a civilian resident was wounded. Sources from the self-proclaimed Luhansk People's Republic reported one Ukrainian violation of the truce inside the republic borders, when Ukrainian forces attacked Kalynivka with small arms, automatic grenade launchers and 82 mm mortars. The press-centre of the ATO HQ reported in the evening that as of 18:00 pro-Russian forces had attacked Ukrainian troops on 6 occasions. In the area of Donetsk city, the stronghold of Avdiivka became the target of small arms, 73 mm antitank recoilless rifles, 82 mm and 120 mm mortars. Pro-Russian armoured fighting vehicles engaged Ukrainian positions at Bohdanivka, in the region of Mariupol, supported by 82 mm mortar fire. In the northern sector of the demarcation line, 120 mm mortar rounds landed in Svitlodarsk and Troitske, while small arms fire was reported at Stanytsia Luhanska. One Ukrainian serviceman was killed and two others were wounded. Pro-Russian sources told the press that during the morning, Ukrainian marines trying to slip through the demarcation line in the area of Verkhnyoshyrokivske, in the region of Mariupol, were met by separatist forces in no-man's land. The subsequent fighting, which involved the use of 120 mm mortars, ended up with the death of two intruders. One pro-Russian serviceman was wounded and another taken prisoner. Pro-Russian media also reported several incidents around Donetsk city, where pro-Russian positions at Spartak, Yasinuvata, Staromyhailivka and Trudovske became the target of small arms, automatic grenade launchers, mortars and artillery. The water purification plant at Donetsk city was also hit. The ATO HQ reported in the morning that pro-Russian forces had opened fire on 8 occasions on Ukrainian positions the previous day (including on 5 occasions in Donetsk region and on 3 occasions in Luhansk region) The spokesman of the Ministry of Defence on issues related to ATO confirmed at noon that one Ukrainian serviceman was killed and two Ukrainian soldiers were wounded in the Donbass region on 2 March. Pro-Russian officials at Donetsk city reported 12 Ukrainian violations of the ceasefire in eight different locations using small arms, snipers, heavy machine guns, automatic grenade launchers, 73 mm antitank recoilless rifles, 82 mm mortars, 120 mm mortars, antitank guided missiles, armoured personnel carriers and armoured fighting vehicles. Authorities from the self-styled Luhansk People's Republic said that Ukrainian forces broke the ceasefire twice, when Kalynove was shelled two times with 120 mm mortars. The ATO press-centre reported in the evening no ceasefire violations during the first 18 hours of 3 March. Later in the evening, 120 mm mortar rounds hit Ukrainian positions at Pisky, in the area of Donetsk city. Vodiane, in the region of Mariupol, was shelled with 82 mm mortars. In the northern section of the demarcation line, rebel forces fired 82 mm mortars at the Ukrainian stronghold of Krymske, while Novhorodske, Malynove, Luhanske, Shchastya and Stanytsia Luhanska were struck by small arms fire, heavy machine gun fire and antitank rockets. According to the information provided by the spokesman of the Ukrainian operational headquarters in the morning, pro-Russian troops had opened fire on 8 occasions on Ukrainian positions the previous day (including on 2 occasions in Donetsk region and on 6 occasions in Luhansk region); the fire was returned on 3 occasions. The spokesman of the Ministry of Defence on issues related to ATO reported at noon no casualties in the Donbass region on 3 March. Pro-Russian authorities at Donetsk city reported two Ukrainian violations of the ceasefire in two locations using small arms, heavy machine guns, automatic grenade launchers, 73 mm antitank recoilless rifles, 82 mm mortars, antiaircraft guns, armoured personnel carriers and armoured fighting vehicles. No Ukrainian violations of the truce were reported by local authorities within the borders of the self-styled Luhansk People's Republic. The press-centre of the ATO HQ reported in the evening that as of 18:00 pro-Russian forces had attacked Ukrainian troops on 4 occasions, no casualties were reported. In the outskirts of Donetsk city, 120 mm mortar volleys landed in Marinka. Pro-Russian tanks, meanwhile, engaged Ukrainian positions around Pavlopil. The same area was attacked with small arms, 120 mm mortars and armoured fighting vehicles. Shyrokyne was also shelled with 120 mm mortars. Pro-Russian media from the self-proclaimed Luhansk People's Republic told the press that Ukrainian forces from Luhanske shelled Kalynivka using rocket launchers and mortars. A renewed truce, dubbed the "absolute ceasefire" and agreed in Minsk on 2 March, came into effect at midnight. The ATO HQ reported in the morning that pro-Russian forces had opened fire on 7 occasions on Ukrainian positions the previous day (including on 4 occasions in Donetsk region and on 3 occasions in Luhansk region); the fire was returned on 2 occasions. The spokesman of the Ministry of Defence on issues related to ATO reported at noon no casualties in the Donbass region on 4 March. Pro-Russian authorities at Donetsk city recorded 13 Ukrainian violations of the ceasefire in eight locations using small arms, heavy machine guns, automatic grenade launchers, 73 mm antitank recoilless rifles, 82 mm mortars, 120 mm mortars, armoured personnel carriers and armoured fighting vehicles. Officially, there were no Ukrainian violations of the truce within the borders of the self-proclaimed Luhansk People's Republic. According to the information provided by the ATO press-centre in the evening, as of 18:00 pro-Russian forces had opened fire on positions of Ukrainian troops on 3 occasions, one Ukrainian serviceman was wounded. Pro-Russian media also reported a number of violations to the new ceasefire agreement. Early in the morning, Ukrainian snipers fired at a snow removal machine manned by pro-Russian servicemen north of Horlivka, while pro-Russian troops at Pikuzy were harassed with small arms, sniper, NSV heavy machine gun and antiaircraft artillery fire coming from the Ukrainian stronghold of Vodiane. A motorcade carrying humanitarian assistance to the area of Yasinuvata, with a Russian Duma member aboard, became the target of 82 mm mortars firing from Avdiivka while passing by Kruta Balka. A Russian Rodina party councilor from the city of Vladikavkaz, North Ossetia, was wounded by a mortar splinter. Later in the evening, Dokuchaievsk was hit by small arms and 82 mm mortar rounds fired from Novotroitske. According to the information provided by the spokesman of the Ukrainian operational headquarters in the morning, pro-Russian troops had opened fire on 3 occasions on Ukrainian positions the previous day (once in Donetsk and twice in Luhansk region); the fire was not returned. The spokesman of the Ministry of Defence on issues related to ATO confirmed at noon that one Ukrainian serviceman was wounded in the Donbass region on 5 March. Pro-Russian authorities at Donetsk city reported three Ukrainian violations of the ceasefire in three locations using small arms, snipers, NSV heavy machine guns, ZU-23-2 antiaircraft guns and 82 mm mortars. The body of a pro-Russian soldier who died in captivity after being taken prisoner by Ukrainian forces near Verkhnyoshyrokivske on 2 March was handed over to pro-Russian authorities. No Ukrainian violations of the truce were reported by local officials within the borders of the self-styled Luhansk People's Republic. The press-centre of the ATO HQ reported in the evening that as of 18:00 pro-Russian forces had attacked Ukrainian troops on 1 occasion, when rebel troops fired small arms, heavy machine guns and rocket launchers at Ukrainian positions at Luhanske, in the northern sector of the demarcation line; no casualties were reported. By the end of the day 2 more attacks were registered, one in Stanytsia Luhanska, also in the northern front, and another at Avdiivka, west of Donetsk city, both involving the use of small arms and automatic grenade launchers. One Ukrainian serviceman was killed in action. The ATO HQ reported in the morning that pro-Russian forces had opened fire on 3 occasions on Ukrainian positions the previous day (including once in Donetsk and twice in Luhansk region); the fire was not returned. The spokesman of the Ministry of Defence on issues related to ATO confirmed at noon that one Ukrainian serviceman was killed in the Donbass region on 6 March. Pro-Russian authorities reported no Ukrainian violations of the ceasefire on the past day. According to local sources, the Ukrainian military broke the ceasefire once within the boundaries of the self-proclaimed Luhansk People's Republic, when Ukrainian forces opened fire with small arms, heavy machine guns and automatic grenade launchers on pro-Russian positions at Lozove. According to the information provided by the ATO press-centre in the evening, as of 18:00 pro-Russian forces had opened fire on positions of Ukrainian troops at Krasnohorivka, west of Donetsk city, using infantry weapons. One Ukrainian serviceman was wounded. Later in the evening, Luhanske and Troitske, in the northern sector of the demarcation line, became the target of heavy machine guns and 73 mm antitank recoilless rifles. Converserly, pro-Russian media reported that the rebel stronghold of Staromykhailivka was shelled with automatic grenade launchers and 120 mm mortars firing from Krasnohorivka. According to the information provided by the spokesman of the Ukrainian operational headquarters in the morning, pro-Russian troops had opened fire on 3 occasions on Ukrainian positions the previous day (including on 1 occasion in Donetsk region and on 2 occasions in Luhansk region); the fire was not returned. The spokesman of the Ministry of Defence on issues related to ATO confirmed at noon that one Ukrainian serviceman was wounded in the Donbass region on 7 March. Pro-Russian authorities at Donetsk city recorded two Ukrainian violations of the ceasefire around Donetsk city using small arms, automatic grenade launchers and 82 mm mortars. The Ukrainian military attacked pro-Russian positions at Yasinuvata and Staromykhailivka. One truck carrying supplies to Donetsk water purification plant was put out of action by hostile fire at Yasinuvata, no injuries were reported. Authorities from the self-proclaimed Luhansk People's republic recorded one Ukrainian violation of the truce when BMP-1 armoured vehicles from Luhanske engaged pro-Russian redoubts at Lohvynove, supported by small arms and heavy machine gun fire. The press-centre of the ATO HQ reported in the evening that as of 18:00 pro-Russian forces had fired small arms on Ukrainian troops on 1 occasion near Avdiivka, west of Donetsk city, where Ukrainian forces became the target of 82 mm mortars; no casualties were reported. By the end of the day 2 more attacks were carried out by rebel forces at Luhanske, in the northern sector of the demarcation line, using heavy machine guns and rocket launchers. One Ukrainian soldier was killed. Pro-Russian media reported that Spartak, west of Donetsk city, came under 82 mm mortar fire. The ATO HQ reported in the morning that pro-Russian forces had opened fire on 3 occasions on Ukrainian positions the previous day (including once in Donetsk and twice in Luhansk region); the fire was not returned. The spokesman of the Ministry of Defence on issues related to ATO confirmed at noon that one Ukrainian serviceman was killed in the Donbass region on 8 March. Pro-Russian authorities at Donetsk city confirmed one Ukrainian violation of the ceasefire around Donetsk city when 82 mm mortar rounds landed in Spartak. There were 33 Ukrainian violations of the truce over the past week, six of them since the beginning of the "absolute ceasefire" on 5 March, according to the same sources. The Ukrainian military fired 131 rounds from 82 mm and 120 mm mortars on the same period. According to the information provided by the ATO press-centre in the evening, as of 18:00 pro-Russian forces had opened fire using infantry weapons on positions of Ukrainian troops on 2 occasions, one at Avdiivka, west of Donetsk city and another at Vodiane, in the region of Mariupol, using infantry weapons. Later in the night, Ukrainian positions at Stanytsia Luhanska were raked by small arms fire. One Ukrainian serviceman was killed and another was wounded. According to the information provided by the spokesman of the Ukrainian operational headquarters in the morning, pro-Russian troops had opened fire on 3 occasions on Ukrainian positions the previous day (including on 2 occasions in Donetsk region and once in Luhansk region); the fire was not returned. The spokesman of the Ministry of Defence on issues related to ATO confirmed at noon that one Ukrainian servicemen was killed and another was wounded in the Donbass region on 9 March. Pro-Russian officials recorded one Ukrainian violation of the truce when Ukrainian forces opened fire on Dokuchaievsk with small arms and automatic grenade launchers. The press-centre of the ATO HQ reported in the evening that as of 18:00 pro-Russian forces had attacked Ukrainian troops on 3 occasions; as a result one Ukrainian serviceman was wounded. By the end of the day, rebel forces had shelled Katerinivka, in the northern sector of the demarcation line, with 82 mm mortars, while the nearby villages of Novhorodske and Krymske became the target of infantry weapons and grenade launchers. In the region of Mariupol, Ukrainian positions at Bohdanivka were struck by antitank rockets and 82 mm mortar rounds. Pro-Russian authorities reported that Ukrainian forces from Shyrokyne, in the region of Mariupol, shelled Sakhanka with 120 mm mortars at dusk. The ATO HQ reported in the morning that pro-Russian forces had opened fire on 5 occasions on Ukrainian positions the previous day (including on 2 occasions in Donetsk region and on 3 occasions in Luhansk region); the fire was not returned. The spokesman of the Ministry of Defence on issues related to ATO confirmed at noon that one Ukrainian serviceman was wounded in the Donbass region on 10 March. Pro-Russian authorities at Donetsk city confirmed one Ukrainian violation of the ceasefire in the region of Mariupol when 120 mm mortar volleys struck Sakhanka. Later in the day, pro-Russian officials told the press that Ukrainian forces also hit a water supply pipeline near Vasiilivka, spilling two tons of water before the pipe could be repaired. According to the information provided by the ATO press-centre in the evening, as of 18:00 pro-Russian forces had opened fire on positions of Ukrainian troops on 3 occasions, all of them in the northern section of the demarcation line, when Luhanske and Novozvanivka became the target of heavy machine guns and 73 mm antitank recoilless rifles, while nearby Novozvanivka was hit by automatically launched grenades. One Ukrainian serviceman was killed by the blast of an explosive device and one Ukrainian soldier was wounded. By the end of the day one more ceasefire violation was registered in the outskirts of Donetsk city, where rebel forces harassed rebel troops with small arms and heavy machine guns. Another two Ukrainian servicemen were wounded. According to the information provided by the spokesman of the Ukrainian operational headquarters in the morning, pro-Russian troops had opened fire on 4 occasions on Ukrainian positions the previous day (including on 1 occasion in Donetsk and on 3 occasions in Luhansk region); the fire was not returned. The spokesman of the Ministry of Defence on issues related to ATO confirmed at noon that one Ukrainian serviceman was killed and three were wounded in the Donbass region on 11 March. Pro-Russian authorities at Donetsk city said that Ukrainian forces broke the ceasefire once, when the village of Uzhivka (Leninske), in the region of Mariupol, was hit by 120 mm mortar fire. The press-centre of the ATO HQ reported in the evening that as of 18:00 pro-Russian forces had attacked Ukrainian troops on 2 occasions. In the northern section of the demarcation line, rebel forces fired small arms and heavy machine guns at Ukrainian positions near Novhorodske, while in the region of Mariupol, the Ukrainian stronghold of Pavlopil was hit by antitank rockets, 82 mm and 120 mm mortar rounds. No casualties were reported at this time, yet by the end of the day 3 more attacks were recorded and two Ukrainian soldiers were wounded. Later in the evening, small arms and 82 mm mortars were fired at Avdiivka, in the outskirts of Donetsk. Pro-Russian BMP-2 armoured vehicles opened fire on Ukrainian positions at Vodiane, in the region of Mariupol, supported by 82 mm mortars, while in the northern section of the demarcation line, Luhanske was hit by heavy machine gun fire and antitank rockets. Pro-Russian media, meanwhile, recorded a number of Ukrainian violations of the ceasefire in the afternoon. A truck carrying supplies and workers to Donetsk water purification plant was attacked while on a highway west of Donetsk city. In the area of Horlivka, one pro-Russian soldier was killed was killed in Zaitseve, when the position he was manning came under small arms, sniper and heavy machine gun fire from Zhovanki. Heavy shelling was reported in the region of Mariupol, where pro-Russian redoubts at Sakhanka, Uzhivka and Dzerzhinske became the target of small arms, heavy machine guns, automatic grenade launchers, 73 mm antitank recoilless rifles, 82 mm mortars and 120 mm mortars. The ATO HQ reported in the morning that pro-Russian forces had opened fire on 5 occasions on Ukrainian positions the previous day (including on 3 occasions in Donetsk region and on 2 occasions in Luhansk region); the fire was not returned. The spokesman of the Ministry of Defence on issues related to ATO confirmed at noon that two Ukrainian servicemen were wounded in the Donbass region on 12 March. Pro-Russian authorities at Donetsk city recorded five Ukrainian violations of the ceasefire in five locations using small arms, heavy machine guns, automatic grenade launchers, 73 mm antitank recoilless rifles, 82 mm and 120 mm mortars. Most incidents took place in the region of Mariupol. One pro-Russian soldier was killed by sniper fire at Zaitseve. According to the information provided by the ATO press-centre in the evening, as of 18:00 pro-Russian forces had opened fire on positions of Ukrainian troops on 3 occasions, one Ukrainian serviceman was injured. Pro-Russian media reported at evening that Ukrainian BMP-1 and BMP-2 armoured vehicles from Avdiivka engaged pro-Russian forces at Spartak. The location, west of Donetsk city, also became the target of small arms, heavy machine guns, 73 mm antitank recoilless rifles and 82 mm mortars. For the second consecutive day, small arms fire from Ukrainian positions hit a truck carrying supplies and personnel to the water purification plant at Yasinuvata. No injuries were reported. According to the information provided by the spokesman of the Ukrainian operational headquarters in the morning, pro-Russian troops had opened fire 4 times on Ukrainian positions the previous day (including two occasions in Donetsk and two in Luhansk region); the fire was not returned. The spokesman of the Ministry of Defence on issues related to ATO confirmed at noon that one Ukrainian serviceman was injured in the Donbass region on 13 March. Pro-Russian authorities at Donetsk city recorded three Ukrainian violations of the ceasefire in three locations, all of them west of Donetsk city, using small arms, heavy machine guns, automatic grenade launchers, 73 mm antitank recoilless rifles, 82 mm mortars, armoured personnel carriers and armoured fighting vehicles. In the main incidents, Spartak, west of Donetsk city, came under attack by small arms, heavy machine guns, 73 mm antitank recoilless rifles, 82 mm mortars, BMP-1 and BMP-2 armoured vehicles. Ukrainian BMP-2 armoured vehicles also engaged pro-Russian redoubts at Trudovske. Small arms fire was reported at Yasinuvata. An isolated mortar attack took place at Pikuzy (Kominternove) in the region of Mariupol. The staff of Donetsk water purification plant refused to work after several small arms attacks on trucks ferrying supplies and personnel to the station, which was virtually under siege from nearby Ukrainian positions. The press-centre of the ATO HQ reported in the evening that as of 18:00 there were no attacks on positions of Ukrainian troops. The ATO HQ reported in the morning no ceasefire violations in the Donbass region on 14 March. The spokesman of the Ministry of Defence on issues related to ATO confirmed the information at noon. No Ukrainian violations of the truce were reported by pro-Russian authorities at Donetsk city. According to the information provided by the ATO press-centre in the evening, as of 18:00 pro-Russian forces had opened fire on positions of Ukrainian troops twice; no casualties were reported. By the end of the day, rebel forces in the northern sector of the demarcation line had attacked Luhanske with small arms, heavy machine guns and 73 mm antitank recoilless rifles and Stanitsya Luhanska with infantry weapons and automatic grenade launchers. In the region of Mariupol, Ukrainian positions around Vodiane and Lebedinske were hit by small arms fire and 82 mm mortar volleys. Pro-Russian media recorded a number of Ukrainian violations of the ceasefire in the evening. BMP-2 armoured vehicles opened fire on Zhabicheve, in the surroundings of Donetsk airport. In the region of Mariupol, Ukrainian BMP-1 armoured vehicles from Shyrokyne engaged pro-Russian positions at Uzhivka (Leninske), supported by 73 mm antitank recoilless rifles. Nearby Sakhanka was fired at from the Ukrainian stronghold of Lebedinske from BMP-1 armoured vehicles and 120 mm mortars. According to the information provided by the spokesman of the Ukrainian operational headquarters in the morning, pro-Russian troops had opened fire on 4 occasions on Ukrainian positions the previous day (including twice in Donetsk and twice in Luhansk region); the fire was not returned. The spokesman of the Ministry of Defence on issues related to ATO reported at noon no casualties in the Donbass region on 15 March. Pro-Russian authorities at Donetsk city recorded three Ukrainian violations of the ceasefire in three locations using 73 mm antitank recoilless rifles, 120 mm mortars, armoured personnel carriers and armoured fighting vehicles. The same sources said that in the course of the past week the Ukrainian military broke the ceasefire 14 times, targeted 12 settlements and fired 63 rounds from 82 mm and 120 mm mortars, weapons banned by the Minsk agreements. Officials from the self-proclaimed Luhansk People's Republic reported that, after seven days of full observation of the truce, Ukrainian forces from Lopaskine shelled Slavyanoserbsk with automatic grenade launchers. The press-centre of the ATO HQ reported in the evening that as of 18:00 no attacks on positions of Ukrainian troops. Later in the day, pro-Russian armoured fighting vehicles from Sanzharivka, supported by heavy machine guns, engaged Ukrainian forces at Troitske, in the northern section of the demarcation line. Separatist authorities told the press that early in the morning, Ukrainian BMP-1 armoured vehicles from Lebedinske engaged pro-Russian redoubts at Sakhanka, in the region of Mariupol, once again supported by 120 mm mortar fire. Ukrainian President Petro Poroshenko announced the end of the "Antiterrorist Operation" (ATO) in Eastern Ukraine and its replacement by the Joint Forces Operation (JFO), based on the provisions of the law of reintegration of the Donbass. General Serhyi Nayev was appointed commander in chief of the joint forces. The JFO HQ reported in the morning that pro-Russian forces had opened fire on 1 occasion on Ukrainian positions the previous day. The spokesman of the Ministry of Defence on issues related to ATO reported at noon no casualties in the Donbass region on 16 March. No Ukrainian violations of the ceasefire were reported by pro-Russian authorities at Donetsk city. According to the information provided by the JFO press-centre in the evening, as of 18:00 pro-Russian forces had opened fire on positions of Ukrainian troops once, at Opytne, using rocket launchers. No casualties were reported. According to the information provided by the spokesman of the Ukrainian operational headquarters in the morning, pro-Russian troops had opened fire on 1 occasion on Ukrainian positions the previous day. The spokesman of the Ministry of Defence on issues related to ATO reported at noon no casualties in the Donbass region on 17 March. Pro-Russian officials from Donetsk city reported no Ukrainian violations of the ceasefire for the second consecutive day. Later, the press service of the Minister of Defence of the Republic of Donetsk confirmed that the village of Sakhanka, in the region of Mariupol, had became the target of small arms and mortar fire on Saturday night. The attack damaged three civilian residences and left the settlement without electrical power and gas supply. The press-centre of the JFO HQ reported in the evening that as of 18:00 pro-Russian forces had attacked positions of Ukrainian troops once, near Avdiivka, no casualties were reported this time. Converserly, separatist media at Donetsk city said that Ukrainian forces from Pisky fired 120 mm mortars at pro-Russian positions around Volvo Center, Donetsk. Ukrainian forces also opened fire on the areas of Spartak and Yasinuvata, according to the same sources. The JFO HQ reported in the morning that pro-Russian forces had opened fire on 2 occasions on Ukrainian positions the previous day, exclusively in Donetsk region. The spokesman of the Ministry of Defence on issues related to JFO confirmed at noon that one Ukrainian serviceman was injured in the Donbass region on 18 March. Pro-Russian authorities at Donetsk city recorded three Ukrainian violations of the ceasefire in three locations using 120 mm mortars. Ukrainian forces shelled the areas of Volvo Center, in the outskirts of Donetsk city, Uzhivka (Leninske) and Sakhanka, in the region of Mariupol. According to the information provided by the JFO press-centre in the evening, as of 18:00 no ceasefire violations were registered. By the end of the day there was 1 attack using infantry weapons on Ukrainian positions at Novohryhorivka, one Ukrainian soldier was wounded. Pro-Russian press reported that Ukrainian forces from Novohryhorivka fired heavy machine guns and antiaircraft artillery on pro-Russian positions at Krasnyi Oktyabr, in the region of Mariupol. According to the information provided by the spokesman of the Ukrainian operational headquarters in the morning, pro-Russian troops had opened fire on 1 occasion on Ukrainian positions the previous day. The spokesman of the Ministry of Defence confirmed at noon that one Ukrainian serviceman was wounded in the Donbass region on 19 March. Pro-Russian officials at Donetsk city reported two Ukrainian violations of the ceasefire in two locations in the region of Mariupol using small arms, antiaircraft guns and 120 mm mortars. Ukrainian forces attacked Krasnyi Oktyabr and Sakhanka, the later with heavy mortar fire for the third consecutive day. The press-centre of the operational headquarters reported in the evening that as of 18:00 pro-Russian forces had targeted positions of Ukrainian troops once, with heavy machine guns and rocket launchers; as a result one Ukrainian serviceman was wounded at Pisky, west of Donetsk city. By the end of the day 4 more attacks were registered and another Ukrainian soldier was injured. In the area around Donetsk city, rebel forces shelled Avdiivka with antitank rocket launchers and 73 mm antitank recoilless rifles. Ukrainian positions at Pisky were hit by heavy machine gun fire and antitank rockets. In the northern section of the demarcation line, Ukrainian troops at Stanytsia Luhanska were harassed with small arms fire, while Luhanske and Troitske were struck by 82 mm mortar volleys. Troitske was later shelled from ZU-23-2 antiaircraft artillery. Pro-Russian authorities told the press that Ukrainian forces from Avdiivka opened fire on Yasynuvata with small arms, heavy machine guns, rocket propelled grenades and 73 mm antitank recoilless rifles. The JFO HQ reported in the morning that pro-Russian forces had opened fire on 5 occasions on Ukrainian positions the previous day (including twice in Donetsk region and on 3 occasions in Luhansk region); the fire was not returned. The spokesman of the Ministry of Defence confirmed at noon that one Ukrainian serviceman was wounded and another injured in the Donbass region on 20 March. Pro-Russian officials from Donetsk city recorded one Ukrainian violation of the truce in the past 24 hours. According to the information provided by the JFO press-centre in the evening, as of 18:00 no ceasefire violations were registered. Pro-Russian sources reported that in the region of Mariupol, pro-Russian forces in the area of Uzhivka (Leninske) and Sakhanka were fired at with 73 mm antitank recoilless rifles, 82 mm mortars and 120 mm mortars from Ukrainian positions at Lebedinske. The spokesman of the Ukrainian operational headquarters reported in the morning that the ceasefire of 5 March was fully observed on 21 March. The spokesman of the Ministry of Defence confirmed the said information at noon. Pro-Russian authorities at Donetsk city recorded three Ukrainian violations of the ceasefire in three locations using small arms, heavy machine guns, automatic grenade launchers, 73 mm antitank recoilless rifles, 82 mm and 120 mm mortars. During his daily briefing, Donetsk People's Republic deputy minister of defence, Eduard Basurin, reported that Ukrainian forces attacked Zhabicheve, near Donetsk airport, with small arms, heavy machine guns, automatic grenade launchers, 73 mm antitank recoilless rifles and 82 mm mortars. In the region of Mariupol, Uzhivka (Leninske) and Sakhanka were shelled with 73 mm antitank recoilless rifles, 82 mm mortars and 120 mm mortars. Though the ceasefire was holding for more than a week within the boundaries of the self-proclaimed Luhansk People's Republic, local officials claimed that Ukrainian troops at Novotoshkivke opened fire with small arms, rocket launchers and 82 mm mortars behind their own lines in an attempt to stage a bogus attack to blame pro-Russian forces. The press-centre of the JFO headquarters reported in the evening that as of 18:00 no ceasefire violations were registered. At noon, pro-Russian officials told the press that Ukrainian forces had broken the ceasefire on two occasions, both of them in Sakhanka, in the region of Mariupol. The first at 09h00, when Ukrainian forces opened fire with 120 mm mortars from Shyrokyne. Two residential buildings were damaged. Later in the day, BMP-1 armoured vehicles from Shyrokyne engaged pro-Russian redoubts in the same area. The JFO HQ reported in the morning no ceasefire violations in the Donbass region for the second consecutive day. The information was confirmed by the spokesman of the Ministry of Defence at noon. On 24 March it was reported that Ukrainian positions in Donbass were attacked once on 22 March, when Ukrainian troops were harassed with small arms fire at an undisclosed location at Donetsk Oblast. Pro-Russian sources at Donetsk city reported four Ukrainian violations of the ceasefire in two locations using 120 mm mortars and BMP-1 armoured vehicles. In the area of Horlivka, 120 mm mortar rounds landed in Zaitseve, while in the region of Mariupol pro-Russian redoubts at Sakhanka were attacked by BMP-1 armoured vehicles supported by 120 mm mortars. Eduard Basurin told the press that Ukrainian forces shelled Sakhanka with the assistance of a drone to direct fire. Basurin claimed that the unmanned aircraft was eventually shot down by pro-Russian troops. There were 12 Ukrainian violations of the truce over the past week. The Ukrainian side fired 76 rounds from 82 mm and 120 mm mortars on the same period. According to the information provided by the JFO press-centre in the evening, as of 18:00 pro-Russian forces had opened fire on positions of Ukrainian troops once, when rebel forces around Donetsk city shelled Avdiivka with 120 mm mortars. By the end of the day 2 more attacks were registered. Rebel troops fired heavy machine guns and rocket launchers at Ukrainian redoubts around Marinka, while 82 mm mortar rounds hit nearby Kamianka. According to the information provided by the spokesman of the Ukrainian operational headquarters in the morning, pro-Russian troops had opened fire on 3 occasions on Ukrainian positions the previous day, exclusively in Donetsk region. The spokesman of the Ministry of Defence reported at noon no casualties in the Donbass region on 23 March. No Ukrainian violations of the ceasefire were recorded by pro-Russian authorities from Donetsk People's Republic and Luhansk People's Republic over the past 24 hours. The press-centre of the operational headquarters reported in the evening that as of 18:00 pro-Russian forces had attacked positions of Ukrainian troops on 5 occasions, no casualties were reported. By the end of the day the Ukrainian side registered 8 more ceasefire violations. Around Donetsk city, Kamianka and Butivka mining complex became the target of small arms, heavy machine guns and rocket launchers. In the region of Mariupol, the same kind of weapons were fired at Ukrainian forces near Lebedinske, Staromyhailivka, Novotroitske and Pavlopil. In the northern sector of the demarcation line, Ukrainian troops at Troitske was hit by heavy machine gun fire and antitank rockets. Small arms fire was reported at Shchastya. One Ukrainian serviceman was killed and another wounded due to improper handling of ammunition. The spokesman of the Ukrainian operational headquarters reported in the morning that pro-Russian forces had opened fire on 13 occasions on Ukrainian positions the previous day (including on 11 occasions in Donetsk region and twice in Luhansk region). The spokesman of the Ministry of Defence reported at noon no combat related casualties in the Donbass region on 24 March. Pro-Russian authorities at Donetsk city recorded three Ukrainian violations of the ceasefire in three locations using small arms, snipers, heavy machine guns, automatic grenade launchers, rocket launchers, 82 mm mortars, 120 mm mortars and tanks. In the area of Donetsk city Ukrainian tanks opened fire twice at pro-Russian positions at Donetsk airport, supported by infantry weapons, rocket launchers and 82 mm mortars. In the region of Mariupol, 82 mm and 120 mm mortar rounds landed in Sakhanka and Pikuzy. In a separate incident, a Ukrainian patrol of 15 infantrymen trying to slip through the demarcation line was forced to get back to their lines after stepping on a minefield near Pisky. The Ukrainians covered their withdrawal with mortar and tank fire. According to the information provided by the JFO press-centre in the evening, as of 18:00 rebel forces had opened fire on positions of Ukrainian troops on 19 occasions, one Ukrainian serviceman was killed. Pro-Russian tanks engaged Ukrainian redoubts at Pisky, in the outskirts of Donetsk city, while 120 mm mortar volleys landed in nearny Opytne. Avdiivka, Butivka mining complex, Verkhnyotoretske, Kamianka, Marinka and Krasnohorivka were struck by small arms fire, heavy machine gun fire and antitank rockets. Pisky was shelled with 120 mm mortars at night, and sniper fire was reported at Marinka, Kamianka, Krasnohorivka and Butivka mining complex. Butivka mining complex was also fired at by armoured fighting vehicles. In the region of Mariupol, Lebedinske and Shyrokyne became the target of 120 mm mortars, while Talakivka came under 82 mm mortar fire. Rebel troops also fired at Talakivka, Shyrokyne, Bohdanivka, Hnutova, Novotroitske, Pavlopil and Vodiane. Ukrainian forces at Hnutove were engaged by armoured fighting vehicles and snipers harassed Ukrainian troops at Shyrokyne. In the northern section of the demarcation line, Novhorodske was hit by small arms fire, heavy machine gun fire and antitank rockets. Heavy machine guns were also fired at Troitske. By the end of the day the total number of registered ceasefire violations had risen to 44, one Ukrainian soldier was injured. Pro-Russian sources told the press that the outskirts of Horlivka received ZU-23-2 antiaircraft fire. One civilian female resident was killed. Later in the day, in the region of Mariupol, Ukrainian forces from Talakivka attacked Pikuzy with small arms, rocket launchers, 73 mm antitank recoilless rifles and 120 mm mortars. The same kind of weapons were used to pound pro-Russian positions at Shyroka Balka, near Horlivka, which later became the target of BMP-2 armoured vehicles from Novhorodske. Donetsk city media also reported heavy fire around Yasinuvata. According to the information provided by the spokesman of the Ukrainian operational headquarters in the morning, pro-Russian troops had opened fire on 44 occasions on Ukrainian positions the previous day (including on 42 occasions in Donetsk region and twice in Luhansk region). The spokesman of the Ministry of Defence confirmed at noon that one Ukrainian serviceman was killed and another injured in the Donbass region on 25 March. Pro-Russian sources at Donetsk city reported eight Ukrainian violations of the ceasefire in six locations using small arms, heavy machine guns, automatic grenade launchers, 73 mm antitank recoilless rifles, 82 mm mortars, 120 mm mortars and armoured fighting vehicles. According to local authorities, Ukrainian forces broke the ceasefire on one occasion within the boundaries of the self-proclaimed Luhansk People's Republic when BMP-1 vehicles from Luhanske shelled pro-Russian positions at Nyzhne Lozove. The press-centre of the operational headquarters reported in the evening that as of 6:00 pm pro-Russian forces had attacked Ukrainian troops on 20 occasions, no casualties were reported. By the end of the day the total number of registered ceasefire violations had amounted to 47. In the outskirts of Donetsk city, the Ukrainian stronghold of Avdiivka was hit by small arms fire, antitank rockets and 82 mm mortar rounds. Rebel forces fired rocket launchers at Kamianka and Butivka mining complex and heavy machine guns at Verkhnyotoretske and Pisky. Ukrainian troops at Marinka were harassed with small arms fire. In the region of Mariupol, the separatists attacked Marinka with infantry weapons and rocket launchers. Pavlopil was raked by heavy machine gun fire, while small arms fire was reported at Talakivka, Hnutove and Shyrokyne. In the northern sector of the demarcation line, pro-Russian armoured fighting vehicles, supported by heavy machine gun fire, engaged Ukrainian redoubts at Novhorodske. Luhanske and Troitske were targeted by heavy machine guns and rocket launchers, while Ukrainian forces at Stanytsia Luhanska came under small arms fire. A renewal of the ceasefire to come into effect on Good Friday (30 March) was agreed in Minsk by all involved parts. The spokesman of the Ukrainian operational headquarters reported in the morning that pro-Russian forces had opened fire on 47 occasions on Ukrainian positions the previous day (including on 40 occasions in Donetsk region and on 7 occasions in Luhansk region); the fire was returned on 10 occasions. The spokesman of the Ministry of Defence reported at noon no casualties in the Donbass region on 26 March. Pro-Russian officials at Donetsk city told the press that Ukrainian forces broke the ceasefire once, when Zaitseve came under 120 mm mortar fire. One pro-Russian soldier was killed in action, and the settlement was left without electrical power. According to the information provided by the JFO press-centre in the evening, as of 6:00 pm pro-Russian forces had opened fire on positions of Ukrainian troops on 13 occasions, no casualties were reported. In the surroundings of Donetsk city, pro-Russian armoured fighting vehicles opened fire on Ukrainian positions at Pisky. Rebel forces fired rocket launchers at Opytne and Marinka, while Avdiivka became the target of infantry weapons. Small arms fire was reported at Butivka mining complex and Kamianka. In the region of Mariupol, Novotroitske, Starohnativka, Hnutove and Lebedinske were hit by antitank rockets. Ukrainian forces at Talakivka, Pavlopil and Vodiane were harassed with small arms and heavy machine gun fire. Small arms fire was reported at Shyrokyne. In the northern sector of the demarcation line, 82 mm mortar volleys landed in Novoluhanske, while Luhanske was hit by heavy machine gun fire and antitank rockets. Rebel forces fired small arms and heavy machine guns at Zaitseve. By the end of the day the total number of registered attacks on positions of Ukrainian troops had risen to 32. A substantial number of ceasefire violations were denounced by pro-Russian authorities during the evening. The Ukrainian military attacked Sakhanka, Sosnovske, Dokuchaievsk, Zhabicheve, Spartak, Petrovsky district, Krasnyi Oktyabr, Yasinuvata and Zaitseve using small arms, heavy machine guns, automatic grenade launchers, 73 mm antitank recoilless rifles, 82 mm mortars, 120 mm mortars and BMP-2 armoured vehicles. According to the information provided by the spokesman of the Ukrainian operational headquarters in the morning, pro-Russian troops had opened fire on 32 occasions on Ukrainian positions the previous day (including on 27 occasions in Donetsk and on 5 occasions in Luhansk region); the fire was returned on 13 occasions. The spokesman of the Ministry of Defence reported at noon no casualties in the Donbass region on 27 March. Pro-Russian sources at Donetsk city reported 12 Ukrainian violations of the ceasefire in ten locations using small arms, heavy machine guns, 73 mm antitank recoilless rifles, 82 mm mortars, 120 mm mortars, armoured personnel carriers, armoured fighting vehicles and 122 mm self-propelled artillery. According to local sources, Ukrainian forces broke the ceasefire on one occasion within the boundaries of the self-proclaimed Luhansk People's Republic when BMP-1 armoured vehicles from Luhanske opened fire on Pro-Russian positions at Lohvynove supported by automatic grende launchers and 82 mm mortars. The press-centre of the operational headquarters reported in the evening that as of 6:00 pm pro-Russian forces had attacked Ukrainian troops on 24 occasions, exclusively in Donetsk region; no casualties were reported. By the end of the day the total number of registered ceasefire violations had risen to 54. In the area of Donetsk city, Pisky came under 82 mm mortar fire, and rocket propelled grenades landed in Avdiivka, Kamianka, Opytne and Pisky. Ukrainian troops at Marinka were harassed with heavy machine gun fire and with small arms fire at Butivka coal mine, while small arms fire was reported at Novomykhailivka.. In the region of Mariupol, pro-Russian forces shelled Shyrokyne with rocket launchers and 122 mm self-propelled artillery. Intense fire was also reported at Pavlopil and Hnutove, where Ukrainian positions were attacked with heavy machine guns, rocket launchers, 82 mm mortars, 120 mm mortars and armoured fighting vehicles. Antitank rockets landed in Novotroitske and Talakivka. In the northern section of the demarcation line, Katerinivka came under heavy machine gun and 82 mm mortar fire, while heavy machine guns and rocket launchers were fired at Shchastya. One officer of the State Emergency Service was wounded by explosion of an unidentified explosive device near Avdiivka. Pro-Russian authorities at Donetsk city told the media that Ukrainian forces broke the ceasefire on several occasions by evening. The Ukrainian military attacked pro-Russian positions at Dokuchaievsk, Spartak, Sakhanka, Sosnovske, Dolomitne, Zheleznaya Balka, Shyroka Balka, Ozeryanivka and Volvo Center using small arms, heavy machine guns, automatic grenade launchers, 73 mm antitank recoilless rifles, 120 mm mortars and BMP-2 armoured vehicles. The spokesman of the Ukrainian operational headquarters reported in the morning that pro-Russian forces had opened fire on 54 occasions on Ukrainian positions the previous day (including on 52 occasions in Donetsk region and twice in Luhansk region); the fire was returned on 28 occasions. The spokesman of the Ministry of Defence reported at noon no combat related casualties in the Donbass region on 28 March. Pro-Russian officials at Donetsk city reported 13 Ukrainian violations of the ceasefire in nine different locations using small arms, heavy machine guns, automatic grenade launchers, 73 mm antitank recoilless rifles, 82 mm mortars, 120 mm mortars, armoured personnel carriers, armoured fighting vehicles and tanks. Authorities from the self-proclaimed Luhansk People's Republic reported five Ukrainian violations of the ceasefire. The Ukrainian military engaged pro-Russian positions at Krasnyi Yar, Slavyanoserbsk, Lozove and Pervomaisk with small arms, heavy machine guns, automatic grenade launchers and 73 mm antitank recoilless rifles. According to the information provided by the JFO press-centre in the evening, as of 6:00 pm pro-Russian forces had opened fire on positions of Ukrainian troops on 32 occasions, one Ukrainian serviceman was wounded and another injured. By the end of the day the total number of registered attacks on positions of Ukrainian troops had risen to 57 and another Ukrainian soldier was wounded. Around Donetsk city, Avdiivka, Opytne and Pisky were hit by small arms fire and antitank rockets. Heavy machine gun and small arms fire was reported at Verkhnyotoretske, Kamianka and Marinka. Ukrainian troops at Butivka mining complex also received small arms fire. In the region of Mariupol, armoured fighting vehicles engaged pro-Russian redoubts at Pavlopil, Pishchevik, Hnutove and Talakivka. Rebel forces fired small arms and 82 mm mortars at Shyrokyne. The separatists also fired heavy machine guns at Talakivka and small arms at Pavlopil. Vodiane, Hnutove, Novotroitske, Pishchevik and Lebedinske. In the northern sector of the demarcation line, Ukrainian troops at Artemove were harassed with small arms fire, while Luhanske became the target of heavy machine guns. According to the information provided by the spokesman of the Ukrainian operational headquarters in the morning, pro-Russian forces had opened fire on 57 occasions on Ukrainian positions the previous day (including on 55 occasions in Donetsk region (53 of these were targeted) and twice in Luhansk region); the fire was returned on 38 occasions. By 11:00 am of 30 March 11 ceasefire violations were registered. The spokesman of the Ministry of Defence confirmed at noon that two Ukrainian servicemen were wounded and one soldier was injured in the Donbass region on 29 March. Pro-Russian officials at Donetsk city reported six Ukrainian violations of the ceasefire in four locations using small arms, heavy machine guns, automatic grenade launchers, 73 mm antitank recoilless rifles, 82 mm mortars, 120 mm mortars, armoured personnel carriers, armoured fighting vehicles and 122 mm self-propelled artillery. In the self-proclaimed Luhansk People's Republic, local authorities recorded two Ukrainian violations of the truce. Ukrainian forces from Svitlodarsk and Luhanske and attacked pro-Russian positions at Lozove and Lohvynove with infantry weapons, antitank rocket launchers and 73 mm antitank recoilless rifles. The press-centre of the Ukrainian operational headquarters reported in the evening that as of 6:00 pm pro-Russian forces had attacked Ukrainian troops on 16 occasions; as a result one Ukrainian serviceman was killed, three Ukrainian soldiers were wounded. By the end of the day the total number of registered ceasefire violations had risen to 32 and one more Ukrainian soldier was wounded. Pro-Russian authorities told the press that Ukrainian forces opened fire on Pro-Russian positions at Uzhivka (Leninske), Yasinuvata, Staromyhailivka, Zheleznaya Balka and Sakhanka using small arms, snipers, heavy machine guns, automatic grenade launchers, 82 mm mortars and BMP-1 armoured vehicles. The spokesman of the Ukrainian operational headquarters reported in the morning that pro-Russian forces had opened fire on 32 occasions on Ukrainian positions the previous day (including on 29 occasions in Donetsk region and on 3 occasions in Luhansk region). The spokesman of the Ministry of Defence on issues related to ATO reported at noon that one Ukrainian serviceman was wounded in action in the Donbass region on 30 March; one Ukrainian soldier was killed and three were wounded by explosion of unidentified explosive device. Pro-Russian officials at Donetsk city reported 19 Ukrainian violations of the ceasefire in nine locations using small arms, heavy machine guns, grenade launchers, 82 mm mortars, 120 mm mortars, armoured personnel carriers and armoured fighting vehicles. According to local sources, Ukrainian forces broke the ceasefire on four occasions within the boundaries of the self-proclaimed Luhansk People's Republic. The Ukrainian military employed small arms, heavy machine guns, under-barrell launched grenades, and BMP-1 armoured vehicles to pound pro-Russian redoubts at Zhovte, Lohvynove, Krasnyi Yar and Kalynove. The press-centre of the Ukrainian operational headquarters reported in the evening that as of 9:00 pm pro-Russian forces had attacked Ukrainian troops on 7 occasions. Around Donetsk city, rebel forces fired small arms and rocket launchers at Ukrainian positions at Avdiivka and Marinka. In the region of Mariupol, Pavlopil came under small arms and heavy machine gun fire three times. Ukrainian forces at Vodiane were hit by small arms fire and antitank rockets. In the northern section of the demarcation line, pro-Russian armoured fighting vehicles engaged Ukrainian positions at Katerinivka. By the end of the day the number of registered attacks had risen to 11 and two Ukrainian soldiers were wounded. Pro-Russian authorities told the press that Ukrainian forces from Krasnohorivka shelled Staromykhailivka using automatic grenade launchers. ^ "Зведення Прес-центру штабу АТО за 28 лютого 2018 року" [Information by ATO HQ on 28 February 2018] (in Ukrainian). MoD. 1 March 2018. Retrieved 1 March 2018. ^ a b c "Боевики снизили свою активность – полковник Гуцуляк" (in Russian). MoD. 2018-03-01. Retrieved 2018-03-01. ^ "ВСУ пять раз нарушили режим прекращения огня — МО ДНР, Представительство ДНР в СЦКК | Официальный сайт ДНР". Официальный сайт ДНР (in Russian). 2018-03-01. Retrieved 2018-03-01. ^ "Количество нарушений режима прекращения огня со стороны ВСУ возросло – Эдуард Басурин (видео) / The number of ceasefire violations from the AFU has increased – Eduard Basurin (video) | Официальный сайт ДНР". Официальный сайт ДНР (in Russian). 2018-03-01. Retrieved 2018-03-01. ^ "Оперативная сводка за сутки с 28 февраля на 1 марта". Goves. Retrieved 2018-03-01. ^ "Зведення Прес-центру штабу АТО станом на 18.00 1 березня 2018 року року" [Information by ATO HQ as of 18:00 1 March 2018] (in Ukrainian). Press-centre of the ATO HQ. 2018-03-01. Retrieved 2018-03-01. ^ a b c "Брифінг речника Міністерства оборони України з питань АТО" [Briefing of the spokesman of the Ministry of Defense of Ukraine on issues related to ATO] (in Ukrainian). MoD. 2 March 2018. Retrieved 2 March 2018. ^ ""ПЕРЕМИРИЕ ПРОДОЛЖАЕТСЯ": ВСУ ВЕДУТ ОБСТРЕЛ ДНР". 1 March 2018. Retrieved 1 March 2018. ^ "Зведення Прес-центру штабу АТО за 1 березня 2018 року" [Information by ATO HQ on 25 February] (in Ukrainian). MoD. 2 March 2018. Retrieved 2 March 2018. ^ "ВСУ три раза нарушили режим прекращения огня — МО ДНР, Представительство ДНР в СЦКК | Официальный сайт ДНР". Официальный сайт ДНР (in Russian). 2018-03-02. Retrieved 2018-03-02. ^ "За неделю ВСУ обстреляли районы 25 населенных пунктов Республики, есть жертвы – Эдуард Басурин / AFU shelled vicinities of 25 populated localities of the Republic during the week, there are victims – Eduard Basurin | Официальный сайт ДНР". Официальный сайт ДНР (in Russian). 2018-03-02. Retrieved 2018-03-02. ^ a b "БАСУРИН РАССКАЗАЛ О ПОПЫТКЕ ПРОРЫВА ВСУ В РАЙОНЕ ПОСЕЛКА ОКТЯБРЬ". 3 March 2018. Retrieved 3 March 2018. ^ "ЗА СУТКИ ВСУ 1 РАЗ НАРУШИЛИ РЕЖИМ ПРЕКРАЩЕНИЯ ОГНЯ". 2 March 2018. Retrieved 2 March 2018. ^ "Зведення Прес-центру штабу АТО станом на 18.00 2 березня 2018 року" [Information by the ATO HQ as of 18:00 2 March 2018] (in Ukrainian). Press-centre of the ATO HQ. 2 March 2018. Retrieved 2 March 2018. ^ a b c "Боевики совершили 8 обстрелов в зоне АТО. Погиб украинский военный – полковник Гуцуляк" (in Russian). MoD. 2018-03-03. Retrieved 2018-03-03. ^ "ВСУ предприняли попытку захватить позиции ДНР на Мариупольском направлении – МО ДНР | Официальный сайт ДНР". Официальный сайт ДНР (in Russian). 2018-03-02. Retrieved 2018-03-02. ^ "ВСУ ОБСТРЕЛЯЛИ ДОНЕЦКУЮ ФИЛЬТРОВАЛЬНУЮ СТАНЦИЮ". 2 March 2018. Retrieved 2 March 2018. ^ "Зведення Прес-центру штабу АТО за 28 лютого 2018 року" [Information by ATO HQ on 28 February 2018] (in Ukrainian). MoD. 3 March 2018. Retrieved 3 March 2018. ^ "ВСУ двенадцать раз нарушили режим прекращения огня — Представительство ДНР в СЦКК | Официальный сайт ДНР". Официальный сайт ДНР (in Russian). 2018-03-03. Retrieved 2018-03-03. ^ "За сутки зафиксировано 12 нарушений режима прекращения огня со стороны ВСУ – Эдуард Басурин / 12 ceasefire violations from the side of the AFU were recorded during the day – Eduard Basurin | Официальный сайт ДНР". Официальный сайт ДНР (in Russian). 2018-03-03. Retrieved 2018-03-03. ^ "ЛНР: ОПЕРАТИВНАЯ СВОДКА – ОБСТРЕЛЯН ПОСЕЛОК КАЛИНОВО". 3 March 2018. Retrieved 3 March 2018. ^ "С начала суток в зоне АТО не было обстрелов, - штаб | "Режим тишины" продолжает сохраняться вдоль всей линии соприкосновения" (in Russian). 112 Ukraine. 3 March 2018. Retrieved 3 March 2018. ^ "IR summary: the occupiers are redeploying tanks to the Debaltsevo direction". Information Resistance. 2018-03-03. Retrieved 2018-03-04. ^ a b c d "За сутки боевики совершили 8 обстрелов, применяли минометы – полковник Праута" (in Russian). MoD. 4 March 2018. Retrieved 4 March 2018. ^ "Зведення Прес-центру штабу АТО за 03.03.2018 року" [Information by ATO HQ on 3 March] (in Ukrainian). MoD. 4 March 2018. Retrieved 4 March 2018. ^ "ВСУ обстреляли Докучаевск и район аэропорта Донецка — СЦКК | Официальный сайт ДНР". Официальный сайт ДНР (in Russian). 2018-03-04. Retrieved 2018-03-04. ^ "Оперативная сводка за сутки с 3 марта на 4 марта". Goves.net. 4 March 2018. ^ "Зведення Прес-центру штабу АТО станом на 18.00 4 березня 2018 року" [Information by the ATO HQ as of 18:00 4 March 2018] (in Ukrainian). Press-centre of the ATO HQ. 4 March 2018. Retrieved 4 March 2018. ^ "В ЛНР ЗАЯВИЛИ ОБ ОБСТРЕЛЕ СО СТОРОНЫ ВСУ — СЦКК". 4 March 2019. ^ a b "Another "complete ceasefire" in Donbass lasted till morning only: EADaily". EADaily (in Russian). Retrieved 2018-03-05. ^ "Зведення Прес-центру штабу АТО за 4 березня 2018 року" [Information by the ATO HQ on 4 March 2018] (in Ukrainian). MoD. 5 March 2018. Retrieved 5 March 2018. ^ a b c "Брифінг речника Міністерства оборони України з питань АТО" (in Ukrainian). MoD. 5 March 2018. Retrieved 5 March 2018. ^ "ВСУ применили по территории Республики 483 единицы боеприпасов – Представительство ДНР в СЦКК / AFU fired 483 rounds on the territory of the Republic – DPR Representative Office to the JCCC | Официальный сайт ДНР". Официальный сайт ДНР (in Russian). 2018-03-05. Retrieved 2018-03-05. ^ "БАСУРИН РАСКРЫВАЕТ ПОДРОБНОСТИ ПЕРВЫХ СУТОК "АБСОЛЮТНОГО ПЕРЕМИРИЯ" В ДНР". 5 March 2018. Retrieved 5 March 2018. ^ "ВСУ тринадцать раз нарушили режим прекращения огня — МО ДНР | Официальный сайт ДНР". Официальный сайт ДНР (in Russian). 2018-03-05. Retrieved 2018-03-05. ^ "Оперативная сводка за сутки с 4 марта на 5 марта". Goves. Retrieved 2018-03-06. ^ "Зведення Прес-центру штабу АТО станом на 18.00 5 березня 2018 року року" [Information by ATO HQ as of 18:00 5 March 2018] (in Ukrainian). Press-centre of the ATO HQ. 2018-03-05. Retrieved 2018-03-05. ^ "Под обстрел ВСУ в районе Ясиноватой попал депутат Госдумы РФ — СЦКК / State Duma deputy fell under AFU shelling near Yasinovataya — JCCC | Официальный сайт ДНР". Официальный сайт ДНР (in Russian). 2018-03-05. Retrieved 2018-03-06. ^ "ВСУ нарушили перемирие, применялось стрелковое вооружение — СЦКК / AFU violated the truce by using small arms — JCCC | Официальный сайт ДНР". Официальный сайт ДНР (in Russian). 2018-03-05. Retrieved 2018-03-06. ^ "ВСУ вновь нарушили перемирие — СЦКК | Официальный сайт ДНР". Официальный сайт ДНР (in Russian). 2018-03-05. Retrieved 2018-03-06. ^ a b "СММ ОБСЕ зафиксировала обстрел жилых кварталов Коминтерново со стороны ВСУ — Представительство ДНР в СЦКК | Официальный сайт ДНР". Официальный сайт ДНР (in Russian). 2018-03-06. Retrieved 2018-03-06. ^ "ДЕПУТАТ ПАРТИИ "РОДИНА" ПОЛУЧИЛ ОСКОЛОЧНОЕ РАНЕНИЕ ПОД АВДЕЕВКОЙ". 8 March 2018. Retrieved 8 March 2018. ^ "Зведення Прес-центру штабу АТО за 05.03.2018 року" [Information by the ATO HQ on 5 March] (in Ukrainian). MoD. 6 March 2018. Retrieved 6 March 2018. ^ a b c "Брифінг речника Міністерства оборони України з питань АТО" [Briefing of the spokesman of the Ministry of Defense on ATO] (in Ukrainian). MoD. 6 March 2018. Retrieved 6 March 2018. ^ "ВСУ три раза нарушили режим прекращения огня — МО ДНР и СЦКК / AFU violated the ceasefire three times — DPR Defense Ministry and JCCC | Официальный сайт ДНР". Официальный сайт ДНР (in Russian). 2018-03-06. Retrieved 2018-03-06. ^ "Разведка отмечает активизацию диверсионно-разведывательных групп противника — НМ ЛНР / Intelligence notices a step-up of the adversary's sabotage and reconnaissance groups — LPR PM | Официальный сайт ДНР". Официальный сайт ДНР (in Russian). 2018-03-06. Retrieved 2018-03-06. ^ "Зведення Прес-центру штабу АТО станом на 18.00 6 березня 2018 року" [Information by the ATO HQ as of 18:00 6 March 2018] (in Ukrainian). Press-centre of the ATO HQ. 6 March 2018. Retrieved 6 March 2018. ^ a b "Зведення Прес-центру штабу АТО за 4 березня 2018 року" [Information by the ATO HQ on 6 March 2018] (in Ukrainian). MoD. 7 March 2018. Retrieved 7 March 2018. ^ a b c "За сутки в зоне АТО боевики совершили 3 обстрела – полковник Гуцуляк" (in Russian). MoD. 2018-03-07. Retrieved 2018-03-07. ^ "Нарушений режима прекращения огня со стороны ВСУ не зафиксировано — Представительство ДНР в СЦКК | Официальный сайт ДНР". Официальный сайт ДНР (in Russian). 2018-03-07. Retrieved 2018-03-07. ^ "ВСУ нарушили "абсолютное перемирие" — НМ ЛНР | Официальный сайт ДНР". Официальный сайт ДНР (in Russian). 2018-03-07. Retrieved 2018-03-07. ^ "Зведення Прес-центру штабу АТО станом на 18.00 7 березня 2018 року року" [Information by the ATO HQ as of 18:00 7 March 2018] (in Ukrainian). Press-centre of the ATO HQ. 2018-03-07. Retrieved 2018-03-07. ^ a b c d "Боевики трижды открыли прицельный огонь в сторону сил АТО – полковник Праута" (in Russian). MoD. 8 March 2018. Retrieved 8 March 2018. ^ "ВСУ вновь нарушили перемирие — СЦКК | Официальный сайт ДНР". Официальный сайт ДНР (in Russian). 2018-03-07. Retrieved 2018-03-07. ^ "Зведення Прес-центру штабу АТО за 07.03.2018 року" [Information by the ATO HQ on 7 March] (in Ukrainian). MoD. 8 March 2018. Retrieved 8 March 2018. ^ "ВСУ продолжают обстреливать территорию Республики – МО и СЦКК | Официальный сайт ДНР". Официальный сайт ДНР (in Russian). 2018-03-08. Retrieved 2018-03-09. ^ "Противник подверг обстрелу гражданские объекты | Официальный сайт ДНР". Официальный сайт ДНР (in Russian). 2018-03-08. Retrieved 2018-03-09. ^ "ЛНР: ОПЕРАТИВНАЯ СВОДКА – ВСУ ОБСТРЕЛЯЛИ ЛОГВИНОВО". 8 March 2018. Retrieved 8 March 2018. ^ "Зведення Прес-центру штабу АТО станом на 18.00 8 березня 2018 року" [Information by the ATO HQ as of 18:00 8 March 2018] (in Ukrainian). Press-centre of the ATO HQ. 8 March 2018. Retrieved 8 March 2018. ^ a b "Зведення Прес-центру штабу АТО за 8 березня 2018 року" [Information by the ATO HQ on 6 March 2018] (in Ukrainian). MoD. 9 March 2018. Retrieved 9 March 2018. ^ "ВСУ открыли огонь по Спартаку | Официальный сайт ДНР". Официальный сайт ДНР (in Russian). 2018-03-08. Retrieved 2018-03-09. ^ a b c "Боевики совершили 3 обстрела, применив минометы – полковник Праута" (in Russian). MoD. 2018-03-09. Retrieved 2018-03-09. ^ "За сутки ВСУ применили по территории Республики три единицы боеприпасов — МО ДНР и СЦКК | Официальный сайт ДНР". Официальный сайт ДНР (in Russian). 2018-03-09. Retrieved 2018-03-10. ^ "После объявления "абсолютного перемирия" ВСУ 6 раз нарушили режим прекращения огня – Эдуард Басурин (видео) | Официальный сайт ДНР". Официальный сайт ДНР (in Russian). 2018-03-09. Retrieved 2018-03-10. ^ "Зведення Прес-центру штабу АТО станом на 18.00 9 березня 2018 року року" [Information by the ATO HQ as of 18:00 9 March 2018] (in Ukrainian). Press-centre of the ATO HQ. 2018-03-09. Retrieved 2018-03-09. ^ a b c d "Вчера боевики трижды нарушили режим тишины – полковник Гуцуляк" (in Russian). MoD. 10 March 2018. Retrieved 10 March 2018. ^ "Зведення Прес-центру штабу АТО за 9 березня 2018 року" [Information by the ATO HQ on 9 March] (in Ukrainian). MoD. 10 March 2018. Retrieved 10 March 2018. ^ "IR summary: the occupation troops got the order of the General Staff of the RF Armed Forces on the reduction of fire activity prior to the election of the President of the Russian Federation". Information Resistance. 2018-03-10. Retrieved 2018-03-19. ^ "ВСУ обстреливали Докучаевск из гранатометов — МО ДНР и СЦКК | Официальный сайт ДНР". Официальный сайт ДНР (in Russian). 2018-03-10. Retrieved 2018-03-10. ^ "Зведення Прес-центру штабу АТО станом на 18.00 10 березня 2018 року" [Information by the ATO HQ as of 18:00 10 March 2018] (in Ukrainian). Press-centre of the ATO HQ. 10 March 2018. Retrieved 10 March 2018. ^ a b c d "Боевики пять раз обстреляли позиции сил АТО – полковник Гуцуляк" (in Russian). MoD. 2018-03-11. Retrieved 2018-03-11. ^ "ВСУ ОТКРЫЛИ МИНОМЕТНЫЙ ОГОНЬ ПО СЕЛУ САХАНКА НА ЮГЕ ДНР". 10 March 2018. Retrieved 10 March 2018. ^ "Зведення Прес-центру штабу АТО за 10 березня 2018 року" [Information by the ATO HQ on 6 March 2018] (in Ukrainian). MoD. 11 March 2018. Retrieved 11 March 2018. ^ "ВСУ применили минометы по Саханке — МО ДНР и СЦКК | Официальный сайт ДНР". Официальный сайт ДНР (in Russian). 2018-03-11. Retrieved 2018-03-11. ^ "ВСУ ОБСТРЕЛЯЛИ ЮЖНОДОНБАССКИЙ ВОДОВОД, ЕСТЬ ПОВРЕЖДЕНИЯ – СЦКК". 11 March 2018. Retrieved 11 March 2018. ^ "ВСУ обстреляли автомобили рабочей смены ДФС — СЦКК / AFU attacked the cars of the DFS work shift — JCCC | Официальный сайт ДНР". Официальный сайт ДНР (in Russian). 2018-03-12. Retrieved 2018-03-12. ^ "Зведення Прес-центру штабу АТО станом на 18.00 11 березня 2018 року року" [Information by the ATO HQ as of 18:00 11 March 2018] (in Ukrainian). Press-centre of the ATO HQ. 2018-03-11. Retrieved 2018-03-11. ^ a b "Зведення Прес-центру штабу АТО за 11 березня 2018 року" [Information by the ATO HQ on 11 March] (in Ukrainian). MoD. 12 March 2018. Retrieved 12 March 2018. ^ a b c "Брифінг речника Міністерства оборони України з питань АТО" [Briefing of the spokesman of the Ministry of Defense on ATO] (in Ukrainian). MoD. 12 March 2018. Retrieved 12 March 2018. ^ "ВСУ один раз нарушили режим прекращения огня — Представительство ДНР в СЦКК | Официальный сайт ДНР". Официальный сайт ДНР (in Russian). 2018-03-12. Retrieved 2018-03-12. ^ "Зведення Прес-центру штабу АТО станом на 18.00 12 березня 2018 року" [Information by the ATO HQ as of 18:00 12 March 2018] (in Ukrainian). Press-centre of the ATO HQ. 12 March 2018. Retrieved 12 March 2018. ^ a b c d "Боевики выпустили около 20 мин из 120-мм и 82-мм минометов – полковник Гуцуляк" (in Russian). MoD. 2018-03-13. Retrieved 2018-03-13. ^ "Саханка вновь под обстрелом ВСУ, он завершился лишь к ночи — СЦКК (обновлено) | Официальный сайт ДНР". Официальный сайт ДНР (in Russian). 2018-03-12. Retrieved 2018-03-12. ^ "От огня украинских боевиков погиб военнослужащий Республики — МО ДНР | Официальный сайт ДНР". Официальный сайт ДНР (in Russian). 2018-03-12. Retrieved 2018-03-12. ^ "Зведення Прес-центру штабу АТО за 12 березня 2018 року" [Information by the ATO HQ on 12 March 2018] (in Ukrainian). MoD. 13 March 2018. Retrieved 13 March 2018. ^ "ВСУ пять раз нарушили режим прекращения огня — МО ДНР | Официальный сайт ДНР". Официальный сайт ДНР (in Russian). 2018-03-13. Retrieved 2018-03-13. ^ "Зведення Прес-центру штабу АТО станом на 18.00 13 березня 2018 року року" [Information by the ATO HQ as of 18:00 13 March 2018] (in Ukrainian). Press-centre of the ATO HQ. 2018-03-13. Retrieved 2018-03-13. ^ "ВСУ обстреляли Спартак из минометов, гранатометов и БМП — СЦКК (обновлено) | Официальный сайт ДНР". Официальный сайт ДНР (in Russian). 2018-03-13. Retrieved 2018-03-13. ^ "КОМАНДОВАНИЕ ВС ДНР СООБЩИЛО О НОВОМ ОБСТРЕЛЕ АВТОКОЛОННЫ С РАБОТНИКАМИ ДФС". 13 March 2018. Retrieved 13 March 2018. ^ "Зведення Прес-центру штабу АТО за добу 13 березня 2018 року" [Information by the ATO HQ on 13 March] (in Ukrainian). MoD. 14 March 2018. Retrieved 14 March 2018. ^ a b c "Брифінг речника Міністерства оборони України з питань АТО" [Briefing of the spokesman of the Ministry of Defense on ATO] (in Ukrainian). MoD. 14 March 2018. Retrieved 14 March 2018. ^ "ВСУ три раза нарушили режим прекращения огня — МО ДНР и Представительство ДНР в С)ЦКК | Официальный сайт ДНР". Официальный сайт ДНР (in Russian). 2018-03-14. Retrieved 2018-03-15. ^ "ВСУ обстреляли Петровский район Донецка — Представительство ДНР в СЦКК | Официальный сайт ДНР". Официальный сайт ДНР (in Russian). 2018-03-14. Retrieved 2018-03-15. ^ "Из-за обстрелов со стороны ВСУ рабочие ДФС отказались выезжать на объект – Эдуард Басурин (видео) / DFS workers refused to go to the site because of AFU attacks – Eduard Basurin (video) | Официальный сайт ДНР". Официальный сайт ДНР (in Russian). 2018-03-14. Retrieved 2018-03-15. ^ "Зведення Прес-центру штабу АТО станом на 18.00 14 березня 2018 року" [Information by the ATO HQ as of 18:00 14 March 2018] (in Ukrainian). Press-centre of the ATO HQ. 14 March 2018. Retrieved 14 March 2018. ^ "Зведення Прес-центру штабу АТО за 14 березня 2018 року" [Information by the ATO HQ on 14 March 2018] (in Ukrainian). MoD. 15 March 2018. Retrieved 15 March 2018. ^ "За сутки в зоне АТО ни одного обстрела со стороны боевиков – полковник Гуцуляк" (in Russian). MoD. 2018-03-15. Retrieved 2018-03-15. ^ "Со стороны ВСУ нарушений режима прекращения огня не зафиксировано — МО ДНР и Представительство ДНР в СЦКК | Официальный сайт ДНР". Официальный сайт ДНР (in Russian). 2018-03-15. Retrieved 2018-03-15. ^ "Зведення Прес-центру штабу АТО станом на 18.00 15 березня 2018 року року" [Information by the ATO HQ as of 18:00 15 March 2018] (in Ukrainian). Press-centre of the ATO HQ. 2018-03-15. Retrieved 2018-03-15. ^ a b c d "Боевики нарушили режим тишины, применив минометы – полковник Гуцуляк" (in Russian). MoD. 16 March 2018. Retrieved 16 March 2018. ^ "ВСУ ведут огонь по населенным пунктам Республики и Донецкому аэропорту — СЦКК (обновляется) | Официальный сайт ДНР". Официальный сайт ДНР (in Russian). 2018-03-15. Retrieved 2018-03-15. ^ "Зведення Прес-центру штабу АТО за добу 15 березня 2018 року" [Information by the ATO HQ on 15 March] (in Ukrainian). MoD. 16 March 2018. Retrieved 16 March 2018. ^ "ВСУ три раза нарушили режим прекращения огня — МО ДНР и Представительство ДНР в СЦКК | Официальный сайт ДНР". Официальный сайт ДНР (in Russian). 2018-03-16. Retrieved 2018-03-16. ^ "За неделю ВСУ обстреляли 12 населенных пунктов Республики, повреждены дома – Даниил Безсонов (видео) / AFU shelled 12 settlements of the Republic during the week, houses were damaged – Daniil Bezsonov (video) | Официальный сайт ДНР". Официальный сайт ДНР (in Russian). 2018-03-16. Retrieved 2018-03-16. ^ "ЛНР: ОПЕРАТИВНАЯ СВОДКА — ОБСТРЕЛЯНЫ ПОЗИЦИИ НАРОДНОЙ МИЛИЦИИ". 16 March 2018. Retrieved 16 March 2018. ^ "Ситуация в зоне ответственности Народной милиции ЛНР обострилась — Андрей Марочко | Официальный сайт ДНР". Официальный сайт ДНР (in Russian). 2018-03-16. Retrieved 2018-03-16. ^ "Зведення Прес-центру штабу АТО станом на 18.00 16 березня 2018 року" [Information by the ATO HQ as of 18:00 16 March 2018] (in Ukrainian). Press-centre of the ATO HQ. 16 March 2018. Retrieved 16 March 2018. ^ a b "Вчера ни один украинский военный не погиб и не получил ранений – полковник Праута" (in Russian). MoD. 2018-03-17. Retrieved 2018-03-17. ^ "ВСУ обстреляли Саханку — Минобороны ДНР | Официальный сайт ДНР". Официальный сайт ДНР (in Russian). 2018-03-16. Retrieved 2018-03-16. ^ "Poroshenko: ATO over, Joint Forces Operation starting". Retrieved 2018-03-18. ^ "Зведення Прес-центру штабу АТО за 16 березня 2018 року" [Information by the ATO HQ on 16 March 2018] (in Ukrainian). MoD. 17 March 2018. Retrieved 17 March 2018. ^ "За сутки со стороны ВСУ не зафиксировано нарушений режима тишины – Эдуард Басурин (видео) / Ceasefire violations by the AFU have not been recorded during the day – Eduard Basurin (video) | Официальный сайт ДНР". Официальный сайт ДНР (in Russian). 2018-03-17. Retrieved 2018-03-17. ^ "Зведення Прес-центру штабу АТО станом на 18.00 17 березня 2018 року року" [Information by the ATO HQ as of 18:00 17 March 2018] (in Ukrainian). Press-centre of the ATO HQ. 2018-03-17. Retrieved 2018-03-17. ^ "Зведення Прес-центру штабу АТО за добу 15 березня 2018 року" [Information by the ATO HQ on 9 March] (in Ukrainian). MoD. 18 March 2018. Retrieved 18 March 2018. ^ "Russian-led forces use grenade launchers to attack Ukraine army in Donbas in past day". UNIAN. 2018-02-01. Retrieved 2018-02-01. ^ "Брифінг речника Міністерства оборони України з питань АТО" [Briefing of the spokesman of the Ministry of Defense on ATO] (in Ukrainian). MoD. 18 March 2018. Retrieved 18 March 2018. ^ "Режим прекращения огня соблюдается двое суток подряд — СЦКК | Официальный сайт ДНР". Официальный сайт ДНР (in Russian). 2018-03-18. Retrieved 2018-03-18. ^ "В результате обстрела со стороны ВСУ в Саханке повреждены газопроводы (фото) / Gas pipelines were damaged in Sakhanka by AFU shelling (photo) | Официальный сайт ДНР". Официальный сайт ДНР (in Russian). Retrieved 2018-03-19. ^ a b "ВСУ СНОВА ОБСТРЕЛЯЛИ САХАНКУ". News-Front. 19 March 2018. Retrieved 19 March 2018. ^ a b "zero". Официальный сайт ДНР (in Russian). Retrieved 2018-03-19. ^ "Зведення Прес-центру штабу АТО станом на 18.00 18 березня 2018 року" [Information by the ATO HQ as of 18:00 18 March 2018] (in Ukrainian). Press-centre of the ATO HQ. 18 March 2018. Retrieved 18 March 2018. ^ "ВСУ обстреляли окраины Донецка — СЦКК | Официальный сайт ДНР". Официальный сайт ДНР (in Russian). 2018-03-18. Retrieved 2018-03-18. ^ "ВСУШНИКИ ПОЗДРАВИЛИ С ПОБЕДОЙ ПУТИНА НА ВЫБОРАХ, ОТКРЫВ ОГОНЬ ПО ДНР". News-Front. 18 March 2018. Retrieved 19 March 2018. ^ "Зведення Прес-центру штабу АТО за 18 березня 2018 року" [Information by the ATO HQ on 16 March 2018] (in Ukrainian). MoD. 19 March 2018. Retrieved 19 March 2018. ^ a b "Боевики дважды открыли прицельный огонь в сторону сил АТО – полковник Гуцуляк" (in Russian). MoD. 2018-03-19. Retrieved 2018-03-19. ^ "Противник обстрелял Донецкое и Мариупольское направления, повреждены частные дома – Эдуард Басурин (видео) / The adversary shelled Donetsk and Mariupol directions, detached houses were damaged – Eduard Basurin (video) | Официальный сайт ДНР". Официальный сайт ДНР (in Russian). Retrieved 2018-03-19. ^ "Зведення Прес-центру штабу АТО станом на 18.00 19 березня 2018 року року" [Information by the ATO HQ as of 18:00 19 March 2018] (in Ukrainian). Press-centre of the ATO HQ. 2018-03-19. Retrieved 2018-03-19. ^ a b "Зведення Прес-центру штабу АТО за добу 15 березня 2018 року" [Information by the ATO HQ on 9 March] (in Ukrainian). MoD. 20 March 2018. Retrieved 20 March 2018. ^ "ВСУ обстреляли поселок Красный Октябрь — СЦКК | Официальный сайт ДНР". Официальный сайт ДНР (in Russian). Retrieved 2018-03-19. ^ "Брифінг речника Міністерства оборони України" [Briefing of the spokesman of the Ministry of Defense] (in Ukrainian). MoD. 20 March 2018. Retrieved 20 March 2018. ^ "ВСУ использовали против Республики минометы и зенитные установки — СЦКК / AFU used mortars and antiaircraft guns against the Republic — JCCC | Официальный сайт ДНР". Официальный сайт ДНР (in Russian). Retrieved 2018-03-20. ^ "Противник обстрелял село в Тельмановском районе из зенитной установки – Эдуард Басурин (видео) / The adversary attacked the village in Telmanovsky district with an antiaircraft system – Eduard Basurin (video) | Официальный сайт ДНР". Официальный сайт ДНР (in Russian). Retrieved 2018-03-20. ^ "Зведення Прес-центру штабу АТО станом на 18.00 18 березня 2018 року" [Information by the ATO HQ as of 18:00 20 March 2018] (in Ukrainian). Press-centre of the ATO HQ. 20 March 2018. Retrieved 20 March 2018. ^ a b "Зведення Прес-центру штабу АТО за 20 березня 2018 року" [Information by the ATO HQ on 20 March 2018] (in Ukrainian). MoD. 21 March 2018. Retrieved 21 March 2018. ^ "ВСУ открыли огонь по Ясиноватой — СЦКК | Официальный сайт ДНР". Официальный сайт ДНР (in Russian). 2018-03-20. Retrieved 2018-03-20. ^ a b c "Боевики пять раз прицельно обстреляли украинских военных – полковник Гуцуляк" (in Russian). MoD. 2018-03-21. Retrieved 2018-03-21. ^ "ВСУ один раз нарушили режим прекращения огня - МО ДНР". Официальный сайт ДНР. 21 March 2018. Retrieved 21 March 2018. ^ "Зведення Прес-центру штабу АТО станом на 18.00 19 березня 2018 року року" [Information by the ATO HQ as of 18:00 21 March 2018] (in Ukrainian). Press-centre of the ATO HQ. 2018-03-21. Retrieved 2018-03-21. ^ "ВСУ открыли огонь по Ленинскому и Саханке - СЦКК". Официальный сайт ДНР. 21 March 2018. Retrieved 21 March 2018. ^ "Зведення Прес-центру штабу АТО за добу 21 березня 2018 року" [Information by the ATO HQ on 21 March] (in Ukrainian). MoD. 22 March 2018. Retrieved 22 March 2018. ^ "В зоне АТО не зафиксовали единого выстрела – полковник Гуцуляк" (in Russian). MoD. 22 March 2018. Retrieved 22 March 2018. ^ "ВСУ три раза нарушили режим прекращения огня". Официальный сайт ДНР. 22 March 2018. Retrieved 22 March 2018. ^ "Из тяжелого вооружения противник обстрелял Донецкое и Мариупольское направления – Эдуард Басурин". Официальный сайт ДНР. Retrieved 22 March 2018. ^ "В ЛНР обвинили Киев в имитации обстрелов со стороны республики". РИА Новости (in Russian). 2018-03-22. Retrieved 2018-03-23. ^ "Зведення Прес-центру штабу АТО станом на 18.00 22 березня 2018 року" [Information by the ATO HQ as of 18:00 22 March 2018] (in Ukrainian). Press-centre of the ATO HQ. 22 March 2018. Retrieved 22 March 2018. ^ "ВСУ обстреляли Саханку из минометов, есть разрушения". Официальный сайт ДНР. 22 March 2018. Retrieved 22 March 2018. ^ "ВСУ стреляли по Саханке из вооружения БМП". Официальный сайт ДНР. 22 March 2018. Retrieved 22 March 2018. ^ "Зведення Прес-центру штабу АТО за 22 березня 2018 року" [Information by the ATO HQ on 20 March 2018] (in Ukrainian). MoD. 23 March 2018. Retrieved 23 March 2018. ^ "Боевики вторые сутки соблюдают режим тишины – полковник Гуцуляк" (in Russian). MoD. 2018-03-23. Retrieved 2018-03-23. ^ a b "Боевики обстреляли Авдеевку из 120 мм минометов – полковник Гуцуляк" (in Russian). MoD. 24 March 2018. Retrieved 24 March 2018. ^ "Украинские боевики четыре раза нарушили режим прекращения огня". Официальный сайт ДНР. 23 March 2018. Retrieved 23 March 2018. ^ "ВСУ ОБСТРЕЛИВАЛИ САХАНКУ С ПОМОЩЬЮ БЕСПИЛОТНИКА — КОМАНДОВАНИЕ ВС ДНР". News-Front. 23 March 2018. Retrieved 23 March 2018. ^ "Зведення Прес-центру штабу АТО станом на 18.00 23 березня 2018 року року" [Information by the ATO HQ as of 18:00 23 March 2018] (in Ukrainian). Press-centre of the ATO HQ. 2018-03-23. Retrieved 2018-03-23. ^ a b "Зведення Прес-центру штабу АТО за добу 23 березня 2018 року" [Information by the ATO HQ for 23 March 2018] (in Ukrainian). Press-centre of the ATO HQ. 24 March 2018. Retrieved 24 March 2018. ^ "ДНР И ЛНР: ОПЕРАТИВНАЯ ОБСТАНОВКА — СУТКИ БЕЗ ОГНЯ". News-Front. 24 March 2018. Retrieved 24 March 2018. ^ "Зведення Прес-центру штабу АТО станом на 18.00 24 березня 2018 року" [Information by the ATO HQ as of 18:00 24 March 2018] (in Ukrainian). Press-centre of the ATO HQ. 24 March 2018. Retrieved 24 March 2018. ^ a b c d e f g "Вчера боевики совершили 13 обстрелов, боевых потерь нет – полковник Праута" (in Russian). MoD. 2018-03-25. Retrieved 2018-03-25. Cite error: Invalid <ref> tag; name "Crisis-03-25ru_noon" defined multiple times with different content (see the help page). ^ "Зведення Прес-центру штабу АТО за 24 березня 2018 року" [Information on 24 March 2018] (in Ukrainian). MoD. 25 March 2018. Retrieved 25 March 2018. ^ "В Саханке повреждены газопровод и жилой дом - СЦКК". Официальный сайт ДНР. 25 March 2018. Retrieved 25 March 2018. ^ "ВСУ обстреливают территорию Республики из запрещенного вооружения - Эдуард Басурин". Официальный сайт ДНР. 25 March 2018. Retrieved 25 March 2018. ^ "ПЫТАЯСЬ ПРОРВАТЬ НАШИ ПОЗИЦИИ, ВСУШНИКИ ПОДОРВАЛИСЬ НА СВОИХ МИНАХ — БАСУРИН". News-Front. 25 March 2018. Retrieved 25 March 2018. ^ "Зведення Прес-центру штабу АТО станом на 18.00 25 березня 2018 року" [Information by the ATO HQ as of 18:00 25 March 2018] (in Ukrainian). Press-centre of the ATO HQ. 2018-03-25. Retrieved 2018-03-25. ^ a b c "Боевики существенно увеличили количество обстрелов, применили танки и минометы – полковник Гуцуляк" (in Russian). MoD. 26 March 2018. Retrieved 26 March 2018. ^ a b "Зведення Прес-центру штабу АТО за добу 25 березня 2018 року" [Information by the ATO HQ on 9 March] (in Ukrainian). MoD. 26 March 2018. Retrieved 26 March 2018. ^ "ВСУ обстреляли Горловку, есть жертвы - Представительство ДНР в СЦКК". Официальный сайт ДНР. 25 March 2018. Retrieved 25 February 2018. ^ "ВСУ открыли минометный огонь по направлению н.п. Коминтерново - Представительство ДНР в СЦКК". Официальный сайт ДНР. 25 March 2018. Retrieved 25 March 2018. ^ "ВСУ ОТКРЫЛИ ОГОНЬ ПО НАСЕЛЕННЫМ ПУНКТАМ ДНР". News-Front. 25 March 2018. Retrieved 25 March 2018. ^ "НА ДОНБАССЕ ОБОСТРЕНИЕ: ВСУ ВЕДУТ МАССИРОВАННЫЕ ОБСТРЕЛЫ ДНР". News-Front. 25 March 2018. Retrieved 25 March 2018. ^ a b "Ministry of Defense: Hostilities escalate drastically in eastern Ukraine, Russian proxies use mortars and a tank". uacrisis.org. MoD. 26 March 2018. Retrieved 26 March 2018. ^ "ВСУ восемь раз нарушили режим прекращения огня — МО ДНР и СЦКК / AFU violated the ceasefire eight times – DPR Defense Ministry and JCCC | Официальный сайт ДНР". Официальный сайт ДНР (in Russian). 2018-03-26. Retrieved 2018-03-26. ^ "ВСУ обстреляли территорию Республики из тяжелого вооружения, есть погибшие, повреждены дома – Эдуард Басурин (видео) / AFU shelled the Republic's territory with heavy weapons, there are victims, houses are damaged – Eduard Basurin (video) | Официальный сайт ДНР". Официальный сайт ДНР (in Russian). 2018-03-26. Retrieved 2018-03-26. ^ "ЛНР: ОПЕРАТИВНАЯ СВОДКА — ОБСТРЕЛЯН ПОСЕЛОК НИЖНЕЕ ЛОЗОВОЕ". News-Front. 26 March 2018. Retrieved 26 March 2018. ^ "Зведення Прес-центру штабу АТО станом на 18.00 26 березня 2018 року" [Information by the ATO HQ as of 6 pm 26 March 2018] (in Ukrainian). Press-centre of the ATO HQ. 26 March 2018. Retrieved 26 March 2018. ^ a b "Зведення Прес-центру штабу АТО за 24 березня 2018 року" [Information by the ATO HQ on 20 March 2018] (in Ukrainian). MoD. 27 March 2018. Retrieved 27 March 2018. ^ ""Пасхальное перемирие" вступает в силу с 30 марта – Денис Пушилин". Официальный сайт ДНР. 26 March 2018. Retrieved 26 March 2018. ^ "При защите рубежей Республики погиб военнослужащий ВС ДНР — Эдуард Басурин (видео) / A serviceman of the DPR Armed Forces was killed when defending the Republic's borders – Eduard Basurin (video) | Официальный сайт ДНР". Официальный сайт ДНР (in Russian). 2018-03-27. Retrieved 2018-03-27. ^ "Зведення Прес-центру штабу АТО станом на 18.00 27 березня 2018 року року" [Information by the ATO HQ as of 6 pm 27 March 2018] (in Ukrainian). Press-centre of the ATO HQ. 2018-03-27. Retrieved 2018-03-27. ^ a b "Зведення Прес-центру штабу АТО за добу 27 березня 2018 року" [Information by the ATO HQ on 27 March] (in Ukrainian). MoD. 28 March 2018. Retrieved 28 March 2018. ^ "ВСУ открыли минометный огонь по Саханке — СЦКК / AFU opened mortar fire on Sakhanka – JCCC | Официальный сайт ДНР". Официальный сайт ДНР (in Russian). 2018-03-27. Retrieved 2018-03-27. ^ "ВСУ открыли минометный огонь по н.п. Сосновское — СЦКК". Официальный сайт ДНР. 27 March 2018. Retrieved 27 March 2018. ^ "В Докучаевске поврежден жилой дом — СЦКК". Официальный сайт ДНР. 27 March 2018. Retrieved 27 March 2018. ^ "ВСУ открыли огонь по Жабичево и Спартаку — СЦКК | Официальный сайт ДНР". Официальный сайт ДНР (in Russian). 2018-03-27. Retrieved 2018-03-27. ^ "ВСУ открыли огонь по Петровскому району Донецка — СЦКК". Официальный сайт ДНР. 27 March 2018. Retrieved 27 March 2018. ^ "ВСУ открыли огонь по населенному пункту Красный Октябрь — СЦКК | Официальный сайт ДНР". Официальный сайт ДНР (in Russian). 2018-03-27. Retrieved 2018-03-27. ^ "ВСУ ведут обстрел Ясиноватой — СЦКК | Официальный сайт ДНР". Официальный сайт ДНР (in Russian). 2018-03-27. Retrieved 2018-03-27. ^ "ВСУ в очередной раз открыли огонь по Зайцево из миномета — СЦКК | Официальный сайт ДНР". Официальный сайт ДНР (in Russian). 2018-03-27. Retrieved 2018-03-27. ^ a b c "30 прицельных обстрелов осуществили боевики по украинским военным – полковник Гуцуляк" (in Russian). MoD. 28 March 2018. Retrieved 28 March 2018. ^ "ВСУ 12 раз нарушили режим прекращения огня — Представительство ДНР в СЦКК / AFU violated the ceasefire twelve times — DPR Representative Office to the JCCC | Официальный сайт ДНР". Официальный сайт ДНР (in Russian). 2018-03-28. Retrieved 2018-03-28. ^ "НАКАНУНЕ ПАСХИ: ВСУ ОБСТРЕЛЯЛИ ПЯТЬ ПОСЕЛКОВ И РАЗРУШИЛИ КЛАДБИЩЕ — БАСУРИН". News-Front. 28 March 2018. Retrieved 28 March 2018. ^ "ЛНР: ОПЕРАТИВНАЯ СВОДКА — ОБСТРЕЛ ЛОГВИНОВО". News-Front. 28 March 2017. ^ "Зведення Прес-центру штабу АТО станом на 18.00 26 березня 2018 року" [Information by the ATO HQ as of 6 pm 28 March 2018] (in Ukrainian). Press-centre of the ATO HQ. 28 March 2018. Retrieved 28 March 2018. ^ a b c d "Зведення Прес-центру штабу АТО за 28 березня 2018 року" [Information by the ATO HQ on 20 March 2018] (in Ukrainian). MoD. 29 March 2018. Retrieved 29 March 2018. Cite error: Invalid <ref> tag; name "MoD_6am_03-29" defined multiple times with different content (see the help page). ^ a b c d "Боевики 54 раза открыли огонь в сторону сил АТО – полковник Гуцуляк" (in Russian). MoD. 2018-03-29. Retrieved 2018-03-29. ^ "ВСУ открыли огонь по Докучаевску — СЦКК / AFU opened fire on Dokuchayevsk — JCCC | Официальный сайт ДНР". Официальный сайт ДНР (in Russian). 2018-03-28. Retrieved 2018-03-28. ^ "ВСУ открыли огонь по Спартаку из БМП — СЦЦК | Официальный сайт ДНР". Официальный сайт ДНР (in Russian). 2018-03-28. Retrieved 2018-03-28. ^ "ВСУ активизировали обстрелы окраины Донецка — СЦКК | Официальный сайт ДНР". Официальный сайт ДНР (in Russian). 2018-03-28. Retrieved 2018-03-28. ^ "ВСУ обстреляли Сосновское — СЦКК | Официальный сайт ДНР". Официальный сайт ДНР (in Russian). 2018-03-28. Retrieved 2018-03-28. ^ "ВСУ вновь обстреляли Саханку из минометов — СЦКК | Официальный сайт ДНР". Официальный сайт ДНР (in Russian). 2018-03-28. Retrieved 2018-03-28. ^ "ВСУ открыли огонь по н.п. Широкая Балка — СЦКК | Официальный сайт ДНР". Официальный сайт ДНР (in Russian). 2018-03-28. Retrieved 2018-03-28. ^ "Украинская армия открыла огонь по н.п. Доломитное — СЦКК | Официальный сайт ДНР". Официальный сайт ДНР (in Russian). 2018-03-28. Retrieved 2018-03-28. ^ "ВСУ открыли огонь по н.п. Железная Балка — СЦКК | Официальный сайт ДНР". Официальный сайт ДНР (in Russian). 2018-03-28. Retrieved 2018-03-28. ^ "ВСУ открыли огонь по н.п. Широкая Балка и Озаряновка — СЦКК | Официальный сайт ДНР". Официальный сайт ДНР (in Russian). 2018-03-28. Retrieved 2018-03-28. ^ "ВСУ продолжают вести огонь по Широкой Балке из гранатомета — СЦКК | Официальный сайт ДНР". Официальный сайт ДНР (in Russian). 2018-03-28. Retrieved 2018-03-28. ^ "ВСУ 13 раз нарушили режим прекращения огня, есть разрушения — Представительство ДНР в СЦКК / AFU violated the ceasefire 13 times, there are destructions — DPR Representative Office to the JCCC | Официальный сайт ДНР". Официальный сайт ДНР (in Russian). 2018-03-29. Retrieved 2018-03-30. ^ "Обстановка на линии соприкосновения существенно обострилась – Эдуард Басурин". Официальный сайт ДНР. 29 March 2018. Retrieved 30 March 2018. ^ "ЛНР: ОПЕРАТИВНАЯ СВОДКА — ОБСТРЕЛЯНЫ ПЯТЬ НАСЕЛЕННЫХ ПУНКТОВ". News-Front. 29 March 2018. Retrieved 30 March 2018. ^ "Зведення Прес-центру штабу АТО станом на 18.00 29 березня 2018 року року" [Information by the ATO HQ as of 6 pm 29 March 2018] (in Ukrainian). Press-centre of the ATO HQ. 2018-03-29. Retrieved 2018-03-29. ^ a b "Зведення Прес-центру штабу АТО за добу 29 березня 2018 року" [Information by the ATO HQ on 27 March] (in Ukrainian). MoD. 30 March 2018. Retrieved 30 March 2018. ^ a b c d "Боевики нарушили перемирие, применив при этом минометы – полковник Гуцуляк" (in Russian). MoD. 30 March 2018. Retrieved 30 March 2018. ^ "В результате обстрелов со стороны ВСУ погибла мирная жительница, есть разрушения – Эдуард Басурин / A civilian died of AFU shelling, there are destructions – Eduard Basurin | Официальный сайт ДНР". Официальный сайт ДНР (in Russian). 2018-03-30. Retrieved 2018-03-30. ^ правды», Цесанна АНТОНЕНКО | Сайт «Комсомольской (2018-03-30). "Обстрелы в ДНР: за минувшие сутки ВСУ 6 раз нарушили режим тишины". KP.RU - сайт «Комсомольской правды» (in Russian). Retrieved 2018-03-30. ^ "ЛНР: ОПЕРАТИВНАЯ СВОДКА — ОБСТРЕЛЯНЫ ДВА НАСЕЛЕННЫХ ПУНКТА". News-Front. 30 March 2018. Retrieved 30 March 2018. ^ "Зведення Прес-центру штабу АТО станом на 18.00 30 березня 2018 року" [Information by the ATO HQ as of 6 pm 30 March 2018] (in Ukrainian). Press-centre of the ATO HQ. 30 March 2018. Retrieved 30 March 2018. ^ "ВСУ открыли огонь по н.п. Ленинское — СЦКК | Официальный сайт ДНР". Официальный сайт ДНР (in Russian). 2018-03-30. Retrieved 2018-03-31. ^ "ВСУ открыли минометный огонь по Старомихайловке — СЦКК | Официальный сайт ДНР". Официальный сайт ДНР (in Russian). 2018-03-30. Retrieved 2018-03-31. ^ "Корреспондент официального сайта ДНР попал под обстрел ВСУ, ранен военнослужащий ДНР / Correspondent of the official website came under AFU shelling, a DPR soldier got wounded | Официальный сайт ДНР". Официальный сайт ДНР (in Russian). 2018-03-30. Retrieved 2018-03-31. ^ "ВСУ открыли огонь по Железной Балке — СЦКК | Официальный сайт ДНР". Официальный сайт ДНР (in Russian). 2018-03-30. Retrieved 2018-03-31. ^ "ВСУ открыли огонь по Саханке и Ленинскому — СЦКК | Официальный сайт ДНР". Официальный сайт ДНР (in Russian). 2018-03-30. Retrieved 2018-03-31. ^ "ВСУ обстреливают Ленинское из гранатомета и стрелкового оружия — СЦКК | Официальный сайт ДНР". Официальный сайт ДНР (in Russian). 2018-03-30. Retrieved 2018-03-31. ^ a b "Ministry of Defense: Russian proxies violate the ceasefire 32 times" (in Russian). MoD. 2018-03-31. Retrieved 2018-04-01. ^ "За сутки ВСУ применили 194 единицы боеприпасов по территории Республики — СЦКК | Официальный сайт ДНР". Официальный сайт ДНР (in Russian). 2018-03-31. Retrieved 2018-04-01. ^ "ЛНР: ОПЕРАТИВНАЯ СВОДКА – ВСУ ОБСТРЕЛЯЛИ ЧЕТЫРЕ ПОСЕЛКА". News-Front. 31 March 2018. Retrieved 31 March 2018. ^ "Прес-центр штабу АТО". www.facebook.com. Retrieved 2018-03-31. ^ "Зведення Прес-центру штабу АТО за добу 31 березня 2018 року" (in Ukrainian). Press-centre of the ATO HQ. 2018-01-01. Retrieved 2018-04-01. ^ "ВСУ открыли огонь по Старомихайловке — СЦКК | Официальный сайт ДНР". Официальный сайт ДНР (in Russian). 2018-03-31. Retrieved 2018-04-01.